Nomadic Press will be releasing an anthology written by Chapter 510 & the Dept. of Make Believe authors taking part in our Black Joy Workshop (a poetry workshop for black young men ages 13-18, led by poet and teaching artist Daniel B Summerhill). 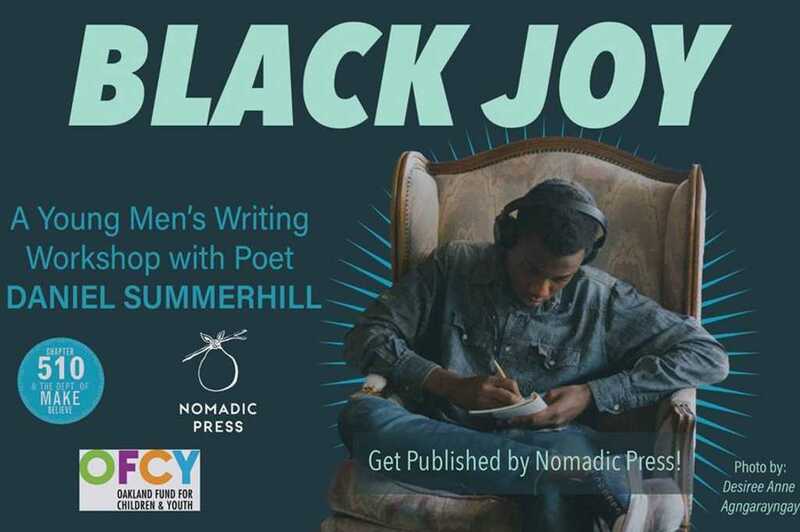 Grab your copy of the anthology and hear readings by Vernon Keeve III, James Cagney, Darius Simpson, Leila Mottley - 2018 Oakland Youth Poet Laureate, the authors published in the anthology (Samuel Getachew, Nicos Hubbard-Riley, Julian Khalil Allen, Elijah I. Hynson, Damion Evans, and Charles Hall), and live music by Azuah Melara starting at 7 PM. Boots Riley will speak at the beginning of the event about the importance of Black Joy. Emceed by the ever-fabulous Nazelah Jamison. DJ XCAIROCITOSX will weave together sounds and Two Mamacita's pop-up kitchen will be on site. Tiny book making on the theme of "Joy" will be happening throughout the evening. On-site photography by Robbie Sweeny and Rohan DaCosta. Oh, and did we also mention it is Oakland First Fridays?! Through publications, events, and active community participation, Nomadic Press collectively weaves together platforms for intentionally marginalized voices to take their rightful place within the world of the written and spoken word. Through its limited means, Nomadic Press is simply attempting to help right the centuries’ old violence and silencing that should never have occurred in the first place and builds alliances and community partnerships with others who share a collective vision for a future far better than today.